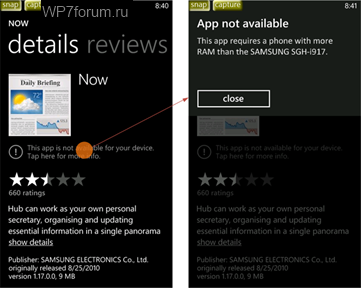 Russian Windows Phone enthusiast site WP7Forum.ru have uncovered screenshots of the Windows Phone Tango update. The first about screenshot shows how limited RAM is now supported, but will result in limited app selection and features. This is part of the initiative to allow manufacturers to provide lower cost phones, not having to comply with previous higher spec requirements. The plus side is that we will likely see greater adoption given the ability of wireless carriers to basically give these phones away with contract. Apps that are not compatible are still accessible from a Marketplace link. The unfortunate result is a message indicating the phone isn’t supported. The go on to detail other changes. On your phone, you can not manage subscriptions to podcasts. For managing podcasts, you need to connect your smartphone to a PC for Windows or Mac OS X, to use Zune or Windows Phone Connector for Mac. As for the camera, the requirements will be 3 megapixels at a resolution of (2048 × 1536).